The CWR Board looks forward to welcoming four new members in January 2019. There will be a vote (by acclamation) to elect the following at the business meeting Wednesday, Oct. 3 at the conference in Fort Worth, Texas: Robert Cogswell, Sister Joanne Gallagher, CSJ; Russ Mancl, and Kimberly Westerman. Robert Cogswell is the director of communications for the Sisters of St. Joseph of Orange, California, a role he has served in since 2007. He credits the wisdom and generosity of successive congregational leadership teams, and experiences through CWR, in building congregational communications from a part-time function to a three-person department. He helped guide the transformation of a print-only operation to a department that collaboratively creates and manages content across multiple media channels. Prior to his current role, Rob simultaneously served as communications manager for the congregation while acting as assistant director for one of its sponsored ministries, the Center for Spiritual Development (CSD). In 10 years with CSD, Rob was responsible for creating, marketing, and operating programs that people paid to attend. In 21 years with the Sisters of St. Joseph of Orange, he has served on more than 100 committees, including the congregation’s sponsorship transition of its healthcare ministry and the congregation’s 100th Jubilee year. Rob earned a bachelor of arts degree in communications from California State University, Fullerton. He and his wife, Shannon, have been married for over 26 years and have two daughters in college. Rob has been a CWR member since 2005. Sister Joanne Gallagher, CSJ, is a Sister of St. Joseph of Boston and has been a member of CWR since 2001. She served on the CWR [then NCNWR] board from 2003–2008 and is currently on the Membership Committee. Joanne is the director of communications for the Sisters of St. Joseph of Boston. She graduated with a BA in English from Regis College, Weston, Massachusetts, and a master’s in theology from the University of Notre Dame, Indiana. For more than 20 years, Joanne was an English and theology teacher as well as a high school campus minister. Joanne has served as communications coordinator on the 2011 and 2016 planning committees for the U.S. Federation of the Sisters of St. Joseph and the Anti-Trafficking Coalition of the Boston Unit of LCWR. She has coordinated many immersion retreats to Mexico and Ecuador for high school students and adults as well as several CSSJ Heritage Pilgrimages. Joanne currently serves on the board of directors for the CSJ Boston Corporation for Sponsored Ministries and the Fontbonne Academy Board of Trustees. Russ Mancl has worked with the Sisters of Mercy of the Holy Cross USA Province, located in Merrill, Wisconsin, for the past 12 years in the area of communications and development. He is responsible for the congregation’s web site, Facebook page, publications and fundraising efforts. 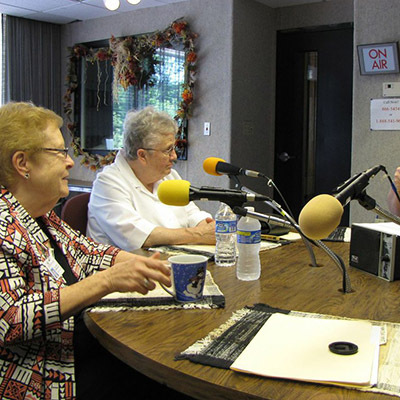 The Sisters of Mercy of the Holy Cross USA Province is a member of the Wisconsin Religious Collaborative and working toward completion. Russ also worked as a reporter and writer for newspapers and radio as well as in radio management in the Midwest. In addition, he worked as an editor for a tourism distribution company. Russ is a Holy Cross Associate. He is also a member of the Association of Fundraising Professionals. He serves on the CWR Marketing Committee, and has been a member of CWR since 2006. Kim Westerman is the congregational communications director for the Sisters of St. Joseph of Carondelet, based in St. Louis. She has worked in the nonprofit sector for a decade with varied experience in volunteer management, human resources, development, and communication. Kim holds a bachelor’s degree in journalism from Truman State University and a master of public affairs degree from the University of Wisconsin-Madison. In addition to her work with the sisters, she is a dedicated community volunteer with groups such as Moms Demand Action for Gun Sense in America, Gateway Pet Guardians, and the Migrant and Immigrant Community Action Project.